There were just a few stories circulating around the family about my grandfather’s service during WW II. One was that his best friend had his head blown off and the other was that he had seen people jumping off of cliffs. 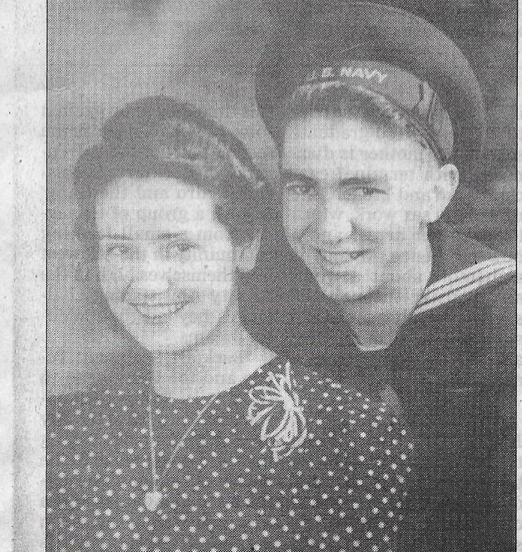 We didn’t know what theater of operations he was in or what ship he had served on, a carrier, destroyer we knew nothing.Shortly after my Grandma Lemke died my Grandpa took a gun and shot himself in the head. It was a very selfish thing to do. It tore us all apart. Their love was special though because it had been forged in war. My grandfather grew up with a man named Delbert Braund. Del, as my grandmother called him, was engaged to my grandmother. We have a few pictures of them together looking very happy. Del was in the 345th Bomb Group, 500th Bomb Squadron. It was a B-25 outfit serving in the South Pacific. They were a bunch of daredevils that would skip bomb Japanese shipping. Del had told Cliff Lemke, “If anything happens to me look out for Eleanor.” Well in August of 1943 Del and about twenty other fellas were in Townsville, Australia while their B-25s were being refitted. Well, Del and his outfit heard that the work on their bombers was complete so they left on a C-47 to rejoin their planes. A minute after take off the C-47 flipped over and crashed into the ocean killing everyone aboard. Cliff found out from family what had happened so he knew he had to tell Eleanor. In the process of sharing mutual grief a spark was lit and stayed lit for over fifty years. Hence the overbearing grief grandpa felt when grandma died. A few months after my grandfather shot himself I noticed my mother crying at the dinner table. I went in and put my arm around her and said nothing. I just held her. She looked up at me and said, “Dennis, I don’t care how you do it but I want you to find out what daddy went through during the war.” I asked her what we had to go on and she told me the two stories mentioned earlier and that was it. Wow! Where to begin? But of course I started the search. I had a very fortunate break. Years earlier I had grandpa autograph a WW II book for me. I hadn’t thought about it in years. So I went to my bookcase, found the book and opened it to the appropriate place and saw, “S1c Cliff Lemke LCI-449 43 to 45.” I showed my mother and she informed me that grandpa had found a map in the book and had circled some islands where he had been. I found the map and saw grandpa had circled Saipan, Guam,Tinian and Iwo Jima. I was stunned. Being an avid WW II reader I had heard all about these horrific battles. So now I knew where he had been but not what he had been through. But where to find this information? One Saturday, I believe it was in 2001, I was downtown in San Antonio, Texas (my home) to do some research at the Alamo archives concerning my dad’s side of the family. I parked my car at the River Center Mall and began to walk to the Alamo. I was immediately struck by how many gentlemen I was seeing wearing hats displaying “National LCI Association.” I could not believe my eyes. I had unknowingly stumbled into a national reunion. I stopped several fellas and asked about the LCI(G)-449. I had my WW II book in my back pack so I showed them where my grandpa had signed and then had them sign it as well. No one knew anything. Well, I am down by the river walk when I stop Bill Brinkley and David Cox. I had stopped the right people. Bill asked which LCI my grandpa had been on to which I of course responded, “The LCI-449.” I will never forget the look on his face when he heard this. His next question set the tone for my research. He asked, “did he survive?”. I was numb. Bill promised to help me in my research. True to his word within a week I had a package from him with a list of current members of the Association who had been on the 449. I called everyone of them and began to get a good idea of the importance of this story and of the horrors endured. This story has consumed my time and money. To date I have found either a veteran or a family member for fifty-four of the seventy names on the roster of the LCI(G)-449. I struck a deal with the folks I contacted. If you will send me copies of what pictures and documents you have I will copy everything I get from everybody else and send it back to you. It has worked extremely well. I now have over one hundred pictures of the ship and crew including a great picture of several men standing with my grandpa in front of the shrapnel riddled conning tower. I also have several months of the deck log of the LCI(G)-449 including the month showing my grandfather coming aboard. I have battle reports for every LCI that was involved, including reports for the Flotilla and Group commanders at Iwo Jima. I also began to search for the stories from the other LCIs that were there. I have talked with the skippers of the 457, 471, 438, and 348 and officers from all the other LCIs. I have talked to over one hundred men who were there including UDT men. I have undertaken the goal of getting a picture of every man who was killed aboard the LCIs of Group Eight at Iwo Jima. Of the fifty-four men killed in Group Eight I have pictures for thirty-five and am close to making contact with a few more families. My mother one day says, “Dennis you should write a book about what you have learned.” I thought about it and laughed.”I don’t have enough material.” My mother silently pointed to my three file boxes full of correspondence and said, “oh, I think you have a pretty good start.” Thus it began. The title was easy to come by because it was provided by the men I interviewed. When talking about the mission I repeatedly would hear the men say, “We were sitting ducks out there.” So thus the book will be called, “Sitting Ducks.” An untold story of a few hundred American sailors taking a beating at Iwo Jima so Marines could have a chance for success. Fifty-four men lost their lives and over one hundred and fifty were wounded. The group would receive awards galore; A Presidential Unit Citation, one Medal of Honor, eleven Navy Crosses, and over one hundred Silver and Bronze stars for selflessly brave acts. The stories from these LCI’s are unbelievable. The smoke, the screams, the fire, the shrapnel, death, life, gore, honor, selflessness, cowardice, fate, chance decisions and duty were a few words describing the day. As the LCIs of Group Eight formed up in line abreast facing the beach with 500 yards between them they increased speed and passed the battleship Nevada. A cameraman aboard the Nevada caught the scene with a quick click of his camera thereby preserving one of the most inspiring LCI photos of World War Two. The LCIs from right to left facing the beach were the 457, 441, 449, 438, 474, 450 and 473. Several sailors including Wally Exum from the 457 told me that when they were near the1,000 yard line from the beach buoys were spotted. Wally looked and thought, “well our Navy didn’t put those there.” At that moment he heard a loud BOOM!!! He looked to his left and saw the 449 take a hit on the bow and it’s 40mm ammunition was blowing up. “I saw two men flying through the air,” said Exum, “I looked to my 40mm crew and said,”I think we’re in for it!” Then they took some hits. The two men flying through the air were S2c John Flook from Myersville, MD. a husband and father of a son named Gene. The crew found his left leg and that was it. The other man flying through the air was Ensign Fredrick Cooper Jr. of Orange City, Iowa. He was a high school teacher and basketball coach and now he was the bow gunnery officer. He was seen by the Engineering officer passing by bobbing in the water unconscious as they continued toward the beach. Cooper’s body was never recovered and his wife and daughter Rebekah would never see him again. Sitting in the pointer position on the bow was S1c Bruce Hallet. The hit from the Japanese mortar had set off the 40mm ammunition causing the splinter shield of the gun tub to fly up and slap Bruce in the back forcing him to the deck saving his life. “I just laid there and crawled to the bow and just hung on as the ammo blew up.” He stood up and saw his good friend Lawrence Bozarth was dead, burned beyond recognition. His head had been blown off and flew back thirty feet into the well deck 20mm position. Bozarth was a religious kid from Oklahoma City whose father was a broom maker. In fact, when on leave in San Diego he went to the local broom shop instead of going to Tijuana, Mexico to party. It was at the broom shop that he met a lovely young lady whom he would write often but never see again. Next to Bozarth’s body was a huge six foot hole where the missing Ensign Cooper had been standing. The gun captain GM3c Chuck Banko was blown back from the 40mm and was unconscious hanging upside down on the ladder leading down to the well deck. He vaguely remembers walking toward the fantail for treatment as instructed to do so by the Boatswains mate Frank Blow. Banko remembers seeing bodies everywhere…it was surreal. These pieces had been his buddies just moments before. They had drank beer together on Mog Mog, read letters aloud together, been through combat on Saipan, Guam, and Tinian without a scratch and now this. It was unbearable. At that moment Chuck Banko mentally refused to take in anymore. To this day he remembers nothing else. William Hildebrand of Louisville, Kentucky was getting ammo from David Fletcher ,the ship’s clown, and passing it up to the bow when he received a face full of shrapnel and fire. The next memory he has is trying to open the door under the ladder to get away from the fire. He says he was not very brave that day. I think differently and so do his shipmates. The next hit was between the two 40s of the gun deck. This is where Charles Hightower was the second loader on the port side 40mm gun. Charles was taking ammo from Robert Minnick, who was an up and coming baseball player, and passing it to a Virginian named Ralph Owens. Hightower and Owens had become best friends. They talked about meeting each others families after the war and about getting married and having a family. On the 40mm gun in the pointer seat position was William Tominac of Chicago. Tominac was a huge guy and was liked by all. Also on the gun was Amos Reagan who had been on the ship for quite awhile. The men of this gun in particular were a comfort to the new guys because they had seen combat at Kwajalein, Eniwetok, Saipan, Guam, and Tinian aboard the 449. The young guys were told that it was a lucky ship. The fellas on the starboard 40mm are a little harder to identify because they were all wiped out and because my grandpa who was on that gun never talked about it. When the mortar hit between the 40s Charles Vogel was coming up the ladder to get aid for those injured on the bow. The flying shrapnel from the second hit removed the top third of his head clean off, helmet and all. He fell where he was, dead. Charles Hightower felt a blast of air and heard swishing and clanging all around him and though his pants were holed he had no injuries. Behind him the eighteen year old Minnick was cut in half. In front of him arms length away lay his best friend Ralph Owens prostrate on the deck mortally wounded. Tominac was slumped over his gun dead. The Tennessean Amos Reagan had been blown off the ship but his life vest had caught on the rail. Reagan ,unconscious, dangled beside the ship inches from the water, smoldering. Charles Hightower pulled him in, patted out the fire on the life vest and saved Reagan’s life. The starboard 40 was a blood bath as well. Norm Holgate ran to the gun deck from the fantail to check on his buddy Clarence Hoffman. Norm told me that Hoffman’s mother had volunteered to write him since Norm’s parents didn’t write. The family had become his own. When Norm made it to the gun deck he saw his buddies lifeless body sprawled out on the deck. Norm could not bear to answer a letter from Mrs. Hoffman weeks later asking if her son was really dead. He had the chaplain do it because it just hurt to much. Clarence Kepner of Cairo, Illinois was the ships cook and had the duty of carrying a stretcher to wherever the wounded were. Responding to the cries of the wounded on the bow he was right on the gun deck headed for the bow when he was slammed in the legs with a sledge hammer. He looked down and his legs were at awkward angles with bones sticking out in several places. Well, this is it he thought. S1c John Overchuck was in the well deck firing away at Iwo Jima with his 20mm when the gun deck was hit. He had just unharnessed himself to go get a replacement part as his gun had malfunctioned. Because of the concussion John blacked out. When he awoke he was lying on the deck staring at half of a man’s face. John thought, “Oh my God is it me?” He reached up and felt his face and discovered all was well. He tried to stand but a few guys had been blown on top of him so he pushed them off and looked up to see what had happened. Up on the gun deck between the 40s stood Howard Schoenleben who had been manning the starboard 40. Howard looked down at John and said, “Jesus Christ John I’m hungry!” Overchuck thought, “Of all the things to say at a time like this.” Well Howard turned and John saw that his whole right shoulder had been blown off and was dangling down by his side complete with the arm. At that moment the Engineering officer Ensign Leo Bedell walked up to Howard, put his arm around his waist and led him to the fantail where first aid was being administered by the Pharmacist mate Henry Beuckman. Leo could see Schoenleben’s heart beating in his chest because of the huge gaping hole where his shoulder had been. Leo lay Howard on the deck gave him a couple shots of morphine and heard Howard ‘s last words, “Howe, Howe, Howe.” Across from Overchuck’s 20mm in the well deck was another 20 fired by the only black guy on the ship, Steward’s mate Ralphael Johnson of Decatur, Texas. Johnson was holding his lower jaw and teeth in his hands because the concussion had thrown the 20mm magazine back into his face. His loader Junior Hollowell, also a Texan, was very concerned about Ralphael and bandaged his buddies wounds and got him some shots of morphine. Hollowell still remembers the sight of all the body parts scattered everywhere and the blood awash over the decks. If things were not bad enough there was more to come. In the conning tower things were somewhat confused. Messages were not being acknowledged in the pilot house below so an officer went to see why no one was answering the orders of movement. As the door to the pilot house flew open the metallic smell of blood slammed against him. Quartermaster William Vollendorf was on the deck with some serious leg wounds. Richard Holtby who was on the headphones was bleeding profusely from his mangled right arm and butchered mandible. Seaman Lareto Paglia was calmly sitting in his chair behind the radio…headless. At this instant a third mortar hit the conning tower right among a huge gathering of men. The Marines knowing that the UDT mission was scheduled for D-2 wanted some of their guys to act as observers. The Marine Corps observer assigned to the UDT team and the 449 was Corporal Edward P. Brockmeyer. He had seen action at Saipan and Tinian and was fearless. He had lost a brother the year before to German air attacks at Salerno. Brockmeyer was one of five boys from the family serving in the military at that time. He would earn a silver star this day. Also in the conning tower was a UDT observer Lt. (j.g.) Leo Yates and a Navy photographer named Leo McGrath. The skipper of the LCI(G)-449 Rufus Herring was there as was the executive officer Byron Yarbrough. Signalman Carl Park of course was there along with his buddy Signalman Arthur Lewis. There was little available space for moving around when the mortar hit right among them. Brockmeyer, Yarbrough, McGrath, Yates and Park were instantly killed. Most of them were unidentifiable. Yarbrough was slumped against the wall with his insides spilling out while the others had to be later picked up with shovels and buckets. Herring was blown out of the conning tower and landed below. Lewis sustained severe wounds in his legs and could not move. Herring wounded and bleeding was wounded a second time by enemy fire from the beach. He had several bones sticking out of his shoulder and somehow summoned the courage to command the ship. He refused medical treatment until the others were taken care of. At this time Herring (the skipper) had a ship with all three forty mm guns out of commission, three of four 20mm guns knocked out, all circuits for firing the rockets disabled and a ship was going in circles. He propped himself up against some empty shell casings that had piled up and he continued to command his ship (He would be awarded the Medal of Honor). However, he was losing too much blood so it was time for someone else to step up. This man was Ensign Bedell. Bedell saw Ensign William Corkins, a father of two boys, slumped against the conning tower with his headset still on and plugged into the jack. He shook him and noticed he didn’t have a scratch on him however his body had turned an awful ashen color. He was dead. Ensign Donald Cromer was wounded and incapacitated. Ensign Bedell who hails from Stow, Ohio was now the only officer of seven not hit. He immediately assumed command of the ship and ordered Lt. (j.g.) Duvall to be treated as he was in shock and losing alot of blood while trying to steer the ship (Duvall would receive the Silver star). Bedell then ordered Frank Blow to take over the wheel and get them the heck out of there. Bedell would receive the Silver star for his quick decisions and superb leadership. Boatswains Mate Frank Blow of Pennsylvania is credited by all as being the one man most responsible for saving their lives. Blow commandeered the ship and took the 449 out of the hazardous area looking for a capital ship to transfer the wounded and dead to. Signalman Lewis would receive the Silver star for somehow summoning the strength to climb atop the conning tower rail and using bloody rags semaphore a request for medical help to the USS Terror, a minelayer. As the 449 drew closer the Terror frantically signaled that the rockets would have to be removed from the starboard side before they would be allowed to come alongside. It was during this time that everyone heard a constant staccato of weapons fire coming from aft of the conn. They looked around and saw Daniel Skluzacek of Minnesota firing away with the only operable 20mm gun. It made everyone feel good to see this veteran of Midway singlehandedly battle it out with the Japanese. The rockets still had to be removed though so Frank Blow, Paul Vanderboom, and then Daniel Skluzacek and others began hurriedly tossing these armed and damaged rockets over the side. Bronze stars were given to Blow, Vanderboom and Skluzacek for their daring and hazardous deed. Now it was time to clean up the hideous mess. Blood and gore were splashed everywhere. The decks of the USS Terror were packed with men staring down at the wounded LCI. Several men from the mine layer volunteered to go aboard and help with the removal of the wounded and dead. The sights they saw would haunt them for the rest of their lives. Remember Kepner the cook whose legs were smashed? Well he survived because the Pharmacist mate tied tourniquets around his legs and told a seamen standing by, “Hold these and don’t let go no matter what.” Fast decisions like this saved lives and limbs. Beuckman had forty-one casualties to deal with and it was because of his awesome performance this day that he was awarded a silver star. He would raise three daughters and work at the VA helping vets acclamate to their new legs. Kepner’s daughter sent me a picture of her father riding a motorcycle with two prosthetic legs and a huge smile on his face. Remember Schoenleben who said’ ” Howe, Howe, Howe “and died? Well I pondered those words for quite awhile and on a hunch I wondered if “Howe” was short for Howard. Maybe Howard had a son named after himself. Several hours of research later I discovered that Howard had been married at the time of his death and did indeed have a son whom shipmates told me he would brag about. I found a Howard Schoenleben in California and left a message on the phone. A short while later he called and informed me that his father probably did not serve with my grandad because his dad had been killed. I asked, “Mr. Schoenleben, was your dad killed February 17th, 1945 at Iwo Jima while serving aboard the LCI(G)-449?” He said, “Why yes. How did you know that?” He then told me that he knew no details about his father’s death. I had the priviledge of telling him, “Mr. Schoenleben, your dad said your name three times and then died.” It was a very emotional time for both of us. There are so many tales like this from the men of all the gunboats that were there that day at Iwo Jima. It was something they would still remember sixty years later. All the 449 men talk of having to pick up hands and heads. Having to spray the decks with power hoses to dislodge the matted blood and human matter. Somehow my grandfather managed to come home after losing all his buddies and raise a family and keep them clothed and fed however, my grandfather would forever be mentally scarred by the horrors he witnessed and endured. All the men of the 449 feel lucky to have survived and they feel sorrow for their buddies whose lives were cut short. They are greatful for the years they have had and the families they have raised. And every February 17th they spend time alone thinking about their buddies and a hunk of sulphuric rock, called Iwo Jima.